Asparagus on a sandwich! I am a fiend for asparagus. I love it so. It is one of the finest of all vegetables. And yet, due to its proportions, I have never once considered including it on a sandwich. When I saw the name of this item on the Literati chalkboard, I could not resist. I am pleased to say that this sandwich lived up to every expectation. The delivery method of the asparagus (cut in half, with the turkey rolled around each stalk) was inspired. The sandwich came together expertly, and I was happy as a clam. The fresh ingredients used at Literati go a long way toward aiding the experience, as the dairy-free pesto has just enough flavor to be a part of the sandwich without overwhelming the other ingredients. Asparagus on a sandwich! How the mind reels! What other new delights await us in the infinite genre of the sandwich? 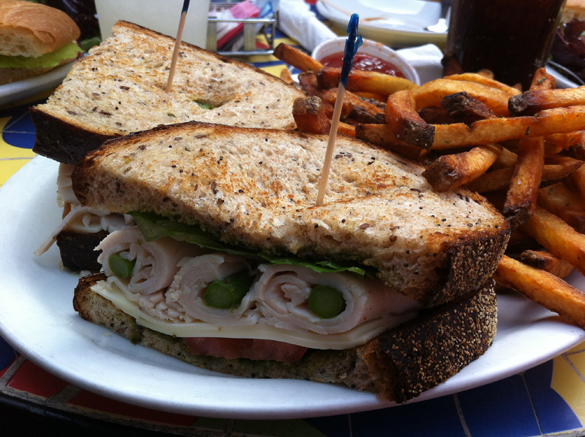 This entry was posted in General Sandwich Discussion, Sandwich Reviews and tagged Los Angeles, Reviews by Bill, Sandwiches I Have Eaten, Sandwiches Made For Me, Turkey by bengrimm. Bookmark the permalink.